Nakamichi MB-VI in console below factory stereo, previously used Boston Acoustics 4 channel amplifier. AVI Sound XL-160 set in rock solid front doors and custom crossovers. 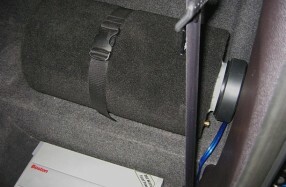 Custom made, vented SoundStream (USA) Exact 8" subwoofer tube. Enjoy your Goldcoast to Brisbane commuting, Trent!